Here’s the latest goal for food makers: Perfect the art of imperfection. When stretching out the dough for its premium “Artisan Pizzas,” Domino’s workers are instructed not to worry about making the rectangles too perfect: The pies are supposed to have a more rustic look. At McDonald’s, the egg whites for the new breakfast sandwich called the Egg White Delight McMuffin have a loose shape rather than the round discs used in the original Egg McMuffin. And Kraft Foods took more than two years to develop a process to make the thick, uneven slabs of turkey in its Carving Board line look like leftovers from a homemade meal rather than the cookie-cutter ovals typical of most lunchmeat. “The goal is to get the same action as if you were cutting with a knife,” said Paul Morin, a Kraft engineer. Food companies are responding to the adage that people eat with their eyes. Americans still love their fast food and packaged snacks, but they’re increasingly turning their noses up at foods that look overly processed. Home-cooked meals — or ones that at least look like they were home-made — are seen as more wholesome and authentic. The result is that companies are tossing out the identical shapes and drab colors that scream of factory conveyor belts. There’s no way to measure exactly how much food makers are investing to make their products look more natural or fresh. But adaption is seen as necessary for fueling steady growth. Over the past five years, the overall packaged food industry in North America grew 14 percent to $392.5 billion, according to market researcher Euromonitor Inter­national. The fast-food industry meanwhile rose 13 percent to $225.6 billion. In many cases, food products get their wholesome appearance because of the different or stripped-down ingredients companies are using to make them more natural, said Michael Cohen, a visiting assistant professor of marketing at NYU's Stern School of Business. But in other cases, companies are making tweaks just to achieve a desired look. “Food manufacturers are adapting by the way they mold the product or the end color or texture they want the product to be,” he said. Appearances have always been a part of food production. But some experts say the visual cues food makers are using to suggest their products are wholesome fuel confusion about what’s natural and what isn’t. A little dressing up can work. Bernell Dorrough, a 31-year-old web marketing coordinator in the Mobile, Ala., area, recently opted for the store brand lunchmeat at the local Publix supermarket in part because the slices came loosely packed in folds rather than in the traditional tight stacks where the meat is peeled off. Food companies are banking on customers like Dorrough. It’s one reason why Wendy’s softened the edges of its famously square hamburger patties. The Dublin, Ohio-based says it changed the patty to a “natural square” with wavy edges because tasters said the straight edges looked processed. At Kraft Foods Group Inc., executives took the quest for a turkey slice that looks home-cooked even further. A team at its Madison, Wis., research facility studied the way people carve meat in their kitchen, using the variety of knives they typically have at their disposal. Instead of the traditional slicers found in delis, the goal was to build a machine that would hack at the meat as a person might, creating slabs with more ragged edges, said Morin, the Kraft engineer. It wasn’t as easy as it sounds since the meat still needs to fit neatly into a package and add up to a certain weight. Morin declined to provide details of the process for competitive reasons but said that no two packages are exactly alike. “We have a way of making sure that the blade cuts the piece of meat differently with each cut,” he said. At Hillshire Brands Co., which makes lunch meats, hot dogs and sausages, executives also are attuned to the fact that more people prize foods they feel are natural. At an industry conference in February, CEO Sean Connolly noted that in addition to taste, the appearance of its food needed work. Specifically, Connolly said people wanted a more natural look for lunchmeat that was “moist but not wet.” They also wanted the turkey to look “a little bit grainier.” Without providing details, a representative for Hillshire, which is based in Chicago, said those changes were achieved through the manufacturing process. Reggie Moore, the company’s vice president of marketing, concedes that the meaning of “natural” is hard to pin down and varies from person-to-person. But as the definition evolves, Hillshire is taking care to signal the natural qualities of its meat visually. 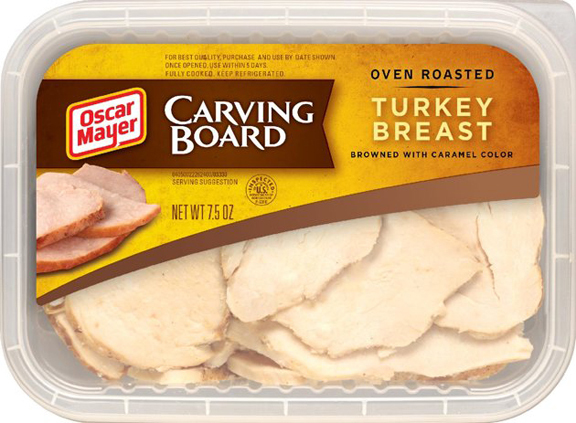 In revamping its turkey slices, for example, one of the cosmetic touchups the company made was darkening the edges of the meat with caramel coloring to give the impression that it was just sliced from a Thanksgiving roast. Ultimately, Moore said the change didn’t really impact the taste.